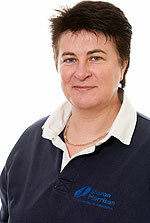 Sharon graduated in Physiotherapy from Robert Gordon's University (formerly the Grampian School of Physiotherapy), Aberdeen (1991), with a Postgraduate Diploma in Biomechanics from the University of Strathclyde (1996) and was awarded an MSc in Sports Medicine from Trinity College, Dublin (1999). She has worked as a Physiotherapist in various settings primarily in the independent sector, entertainment industry, elite sport and professional dance. This has included extensive work in the management of sports and dance related injuries from the recreational athlete and professional dancers through to the elite Olympians. 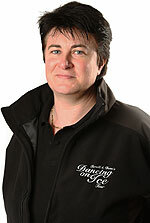 She has been established as the exclusive Consultant Physiotherapist to Jayne Torvill and Christopher Dean and their ice touring companies from 1994. She next moved into professional dance and became the designer and Clinical Director of the Dance Injuries Centre - opened by HRH Prince Charles in 2002 as The Jerwood Centre (for the prevention and treatment of dance injuries) at the Birmingham Royal Ballet after securing a sizeable grant from the Jerwood Foundation. Before her departure from BRB she was also the Consultant involved in assisting the previous Elmhurst Administration on their relocation and design of the Physiotherapy department and administration of the Physiotherapy provision with the Jerwood Centre staff. In 2005, after 7 years with BRB introducing injury prevention strategies, lowering the injury rate and increasing the longevity of a dancer's career, she left to pursue independent consultancy in sports and dance medicine. 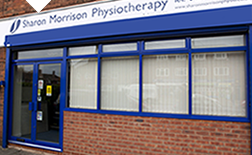 Clients are local (self, GP, Consultant, Coach referrals) from Birmingham and the Sutton areas (around the clinic) although many clients also travel from locations throughout the UK and more recently Europe. Professional roles to date include the Director of the Sutton Coldfield clinic, Advisor on the Physiotherapy Advisory Board of Dance UK, Physiotherapy Consultant and Medical Co-ordinator on ITV's Ninja Warrior UK, WOS Wrestling, Dancing On Ice, Torvill & Dean's Dancing On Ice Live Tours, Strictly Come Dancing Live UK Tours, Consultant Physiotherapist to Phil McIntyre Entertainment and Live Nation and previous Physiotherapy Consultant and Service Provider to the Elmhurst School For Dance (2009 - 2017).